I loved them back when I was a kid,and still love them.You can still buy them loose at some stores.The ones you buy loose are bigger and taste better too.I first started buying them at the movies in the sixties. Good stuff....esp. when at the movies !!! 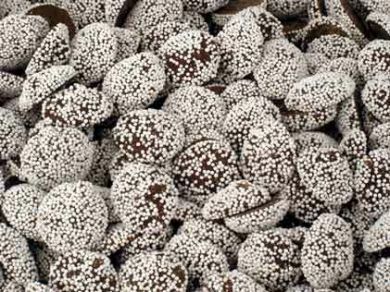 Nonpareil is from the French meaning 'this is no equal' meaning it's the best you can get. That said, I hated these when we would buy them at the Capital movie theater in Owosso, Michigan in the 60's. To me, they tasted like bitter chalk. These had the richest chocolate taste of any candy. Is there also a candy called a pareil? If this is a nonpareil, there must be an opposite. What would that be? i could never, still can't in fact pronouce these delish candies...anyone out here know the correct pronounciation???? ate em up at the movies all the time !!! These were my grandmother's favorite candy, as long as the chocolate was dark and bittersweet. But the ones that came in the little boxes were not good. She bought hers in bulk in a real candy store. I still have the glass container she used to keep them in, and she died at 85, 60 years ago. The only place I ever encountered these was at the movies.